Information: Çavit Kangöz, teacher of Turkish and Balkan dance. Çavit Kangöz taught Turkish dances to folk dancers on the East Coast. He had stayed in the United States when the dance company he was with went back to Turkey. Çavit produced a couple of dance camps in Connecticut. He was invited to teach in Stockholm, Sweden. Çavit toured the United States and Canada with Sonny Newman from New York to California. The guys were delivering a car and slipped their arrival date by a long time! Michael and Mary Ann Herman occasionally conducted family folk dancing on Sundays during which they incorporated a year-end Festival and Workshop into their schedule. Çavit was one of the workshop teachers. Çavit was the first foreign teacher to teach Turkey and Balkan dances in Japan in 1969 after being recommended to the Japan Folk Dance Federation by Ralph Page who had met Çavit in America in 1964. In 2013, he attended a party in Tokyo with Yves Moreau. Çavit is doing amazingly well for his respectable age of 80 (2013) and is not on the teaching circuit anymore. 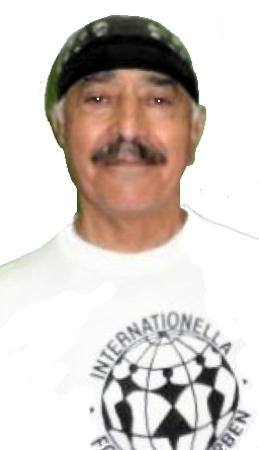 He is retired and living in Stockholm, Sweden, teaching modern dance and jazz dance. The photo, above, was taken at a dance party in Tokyo, Japan in October of 2013. He likes to keep in contact with all of his folk dance friends around the world.